Health and the Environment – Brought to you in an interactive and informative way! The Environmental Health Student Portal is one of many databases offered by the National Library of Medicine. 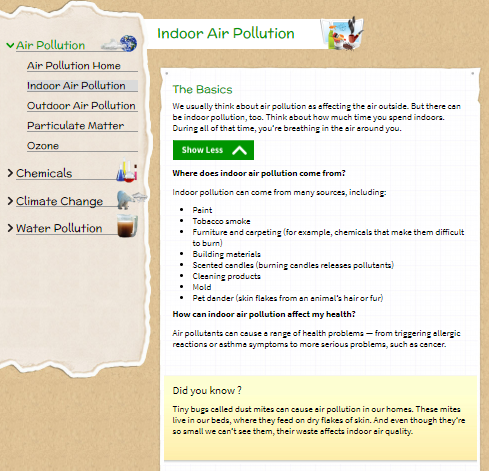 This database is special because it offers, both educators and students, a connection to environmental health information through simple text and interactive activities. The topic areas covered include, air pollution, chemicals, fossil fuels, greenhouse gases and water pollution. Each topic area contains a brief overview, providing basic information, as well as a bonus “Did you know?” fun fact, pertaining to the subject. You can browse the website easily, allowing you to find articles, videos, experiments and projects to share with your students on each topic area mentioned above. In fact, to easily locate lesson plans and educational activities for your students, you can click on the “For Teachers” tab to the far right of the page on the tool bar. This will redirect you to a page specifically designed for teachers with a variety of resources organized by topic area. Come explore the Environmental Health Student Portal to re-vamp your lesson plans and engage your students today! To access the "For Teachers" tab directly, click here. To access the "Home" page, click here.